The package includes all the currently available temlates of cutting schemes for labels of the telephones and tablets for the Apple brand. File Format CDR (CorelDRAW). Files can be converted from this format into ai, dwg, dxf, emf and other formats. I. e., the template can be used at any plotter for printing and cutting of any scale. 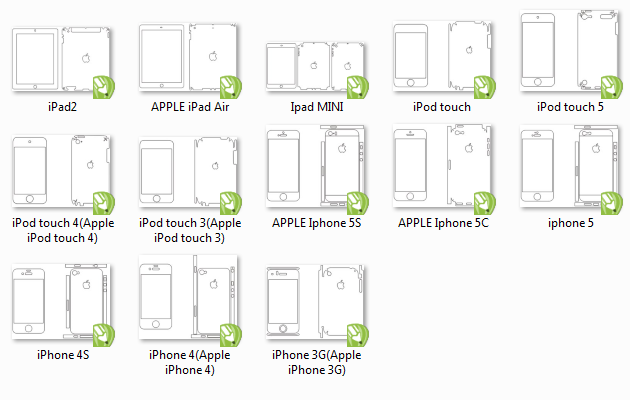 All the templates cover the body of a device to the limit. A layout can be used to produce not only labels (skins) but also protective films. The list of all the models you can find in the tab Specifications.